Get a local perspective of Mykonos beyond the famous sunsets, nightlife and windmills on a 4-hour tour of the island’s rich history and authentic culture. Travel far off the beaten tourist path as you enjoy a light snack and visit a working organic farm, a monastery, a traditional village market, and the lovely port of St. Ioannis. Your half-day island adventure begins with midmorning pickup at your hotel or the Mykonos cruise port. Start with a visit to the charming port town of St. Ioannis, where you can see fishing boats gathered in the harbor and visit the historic church where the town’s patron saint once lived and where an annual fair is held in his honor. Next, get a more modern perspective with a stop at the Mykonos airport, offering a chance to see planes arriving and departing the island. Continue on to the the traditional village of Ano Mera, where you’ll be welcomed at an organic family farm. Get a personalized tour from the superintendent, including hands-on exploration of farming equipment and a chance to meet the livestock. Before leaving Ano Mera, see where locals shop at the open-air market and take a guided tour of the Panagia Tourliani monastery, one of only two on the island. Drive by the unspoiled beaches of Kalo Livadi, Kalafati, and Aghia Ann, keeping your camera handy for a photo stop, and relax over a light Greek-style lunch or snack (depending on lunch option selected). Finally, take in a fantastic panoramic view of Mykonos Town before saying goodbye to your guide back at your hotel, the cruise port, or another central location of your choice. Alternatively, upgrade to include a guided walking tour of Mykonos Town. I was on a cruise and took several tours - this tour, by far, was my favorite!! When my cruise ship pulled in to port in Mykonos, we were not in the port that we were expected to be in - and where I was to meet my tour guide. Someone on the cruise ship called the tour and explained my situation and they said not to worry about it, they would meet me where I was - which was great! 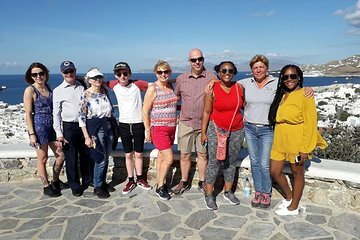 There were 6 of us touring Mykonos in a van - we toured the tourist areas of the island - stopped in several areas for photo ops - and then toured the farmland - where the residents are. We had a wonderful meal at the home of a local farmer, toured the farm - animals, herbs, fruit, vegetables - all locally grown. The tour guide, Anastasia, was extremely knowledgeable and fun! She told us about the history of Mykonos, explaining much of the culture - and gladly answering questions - I highly recommend this tour! This tour is appropriately named. We saw almost all of the island and not just the traditional sea port picture of beautiful white houses. Anastasia was our guide and she did a marvelous job of ensuring we had an overview of the island. We stopped at a countryside farmhouse to experience the rural life, as well as the best beach views. Our group was small and the mini coach we traveled in was super comfortable. There was a nice mix of walk and ride and plenty of information of Mykonos. The tour was probably a 5 star in quality but I didn't leave it wanting to tell everyone they missed out on an awesome day. Maybe I had too much time with the animals on the farm. Our tour guide, Kayla, was fantastic! As a young couple- we wanted time to explore Mykonos and this tour was everything we wanted and more! We got a chance to visit the best beaches, pet donkeys, and see some great views with time to shop! One of the best investments we’ve made. Enjoyable driving tour, and a way to see the non-tourist part of the island. Very narrow roads, so happy to have someone else driving. Stops were not particularly exciting, but we saw everything the island had to offer. A good way to get way from the tourist and cruise line crowds and see a more relaxed Mykonos. This is a very different tour. You will get a perspective of the usual tourists vistas of Mykonos, and then you will see a farm and pet the donkeys, visit a small village and monastery, see a water-storage reservoir, a small church, and a beach. If you want to learn about the island apart from the jet-set villas, this is a good tour. Not a bad tour, but felt a lot of it was a little contrived. Generally stayed away from the glitzy side, which was good, but we felt that the old town would certainly have fitted into the tour rather than some of the more boring stuff. Our guides were friendly and helpful, but the head guide spent a lot of the time on the mini-bus talking loudly in Greek to the driver which was distracting and not offering sufficient assistance to her male colleague who was under training and who struggled occasionally. Waste of time. Better to just rent a car and drive around the island. We were picked up at the port on time. The two guides and driver were friendly and didn't mind all the questions we gave them! The tour was excellent and plenty of time for photo stops. Covered all of the island. Recommend you do it too. Thank you so much for a brilliant tour. Had a wonderful unique experience, highly recommend! Well, run and organized, but pretty boring.